This correspondence is between George Luther Stearns and several prominent abolitionists, including Colonel James Montgomery, George W. Collamore, Mary A. Brown, and John Brown, Jr. Included is a circular from the Office of the Kansas Relief Committee, of which Stearns was chairman, seeking clothing and other goods. Stearns received letters from individuals, wholesalers, retailers, and charitable organizations relating to the donation of various articles, goods, and money. 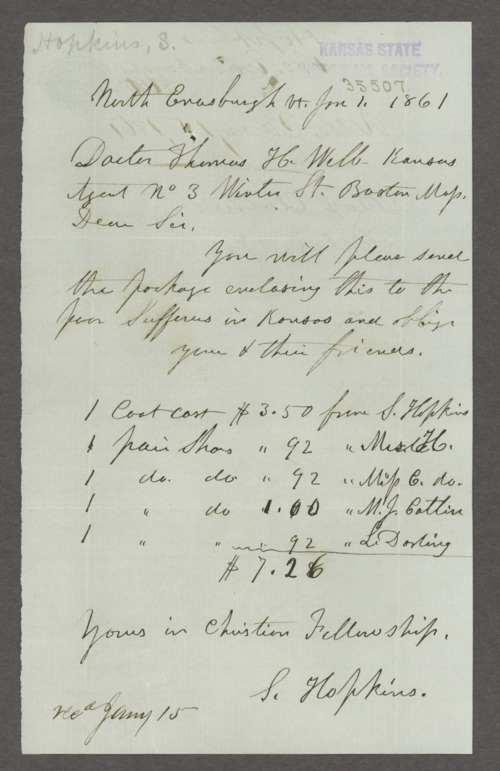 It is also discussed how these donations, especially clothing, would benefit the 2nd and 3rd Regiments. A letter from Eleanor S. Deane includes a poem entitled, "To the Little Boys and Girls of Kansas."